Rebuilt starter motor is in and the car seemed fine. I did not have time for a test drive yet. I will do that today! Thanks for the ATF advice. Went for a test drive and everything seems to work well except my wipers. They work but at same speed in all positions. An electrical gremlin I would think. Edit: They are now OK but a slight sluggish. Lack of circulation I guess! Took some pics of my engine bay but they didn't come out very well, will try a bit later. Sounds like you need to just keep driving it regularly to allow it all to dry out and recover. Did you change the diff oil? I did mine a few months ago, was straightforward but easier without the spare wheel frame. Yes I changed the diff oil. It looked fine but it also was overdue. I made a bit of a mess pouring it in, but I was also prepared for it! I'll keep working on it and go on increasingly longer drives until I feel confident with the car. Edit: Well now the aircon is not working. Can't live without that here! You must have done a lot of work with your car to know it so well. Great, yes I recall mine being a pig to fill as the filler hole isn't that easy to get to. I bought a jumbo copper sealing washer set from eBay for these jobs too as you should not reuse the washers: when you tighten (squash) them they harden. I did try aluminium but I kept melting them when I tried to re-use them (smear with soap, heat up until the soap goes black). Copper are much easier to re-use (anneal), support on a wire and heat up to red. I found with scooters, cars and the van it helped to have a box of new ones LOL. I'm doing the same as you - longer and longer trips as a gain confidence that everything is OK. If the engine fan kicked up salt water over the engine it could have disturbed the electric clutch at the front on the compressor - so if it all seems to work but never actually engages you may wish to look at that. To look properly however you'll have to take the other engine cover off (drivers seat, fold carpet forward, undo handbrake + bolts, remove cover. Tip: Getting the handbrake bolted back to the cover can be tricky - the bolts don't go in unless the angle is just right. You may also want to check the 2nd fan - the big electric fan at the front laying flat on the 2nd radiator and AC rad, the sensor is on the engine just below the coolant cap detecting coolant heat that's just left the head. With the ignition on, unplug the sensor and the fan should run. I think that's used for AC too. 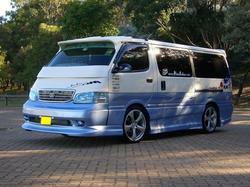 My van was modified but not serviced, when I bought it (from Japan), but looked nice and was rust free. I had them change the engine oil and air filter (I had to re-attach the air-filter lid as it was not quite seated correctly). It drove well and the head etc is all good. I have a small parking lift so I can access the underneath so I decided to change the diff and ATF fluids, on change #4 of the ATF as the new fluid washed out some dirt. I also changed the front discs and pads as they'd been overheated ('warped') and cleaned the rear drums out. I sorted out the rear suspension which had been lowered excessively and poorly, adjusted the front up too, and trimmed a mudflap that was melting on the bigger exhaust box. I then flushed and modified the cooling system. Fitted LED lights + regulators everywhere (except for head/fog lamps which were replaced for new Toyota units and super-bright Philips bulbs. I added a digital temperature controller for the AC. New radio and rear camera. New front speakers and tweeters and crossover. Added insulation in the roof + painted top of rear blinds white (house emulsion so it stays white) + covered moon roof shade with silver bubble foil on top to reflect heat. Added switched override and voltmeter for the moon-roof. (Voltmeter tells me it's on, switch does off, acc, on). Added remote locking with alarm. So yes, it was going to be a boring Toyota that just worked but it's turned into a bit of a hobby LOL, one day I may upgrade to a new van but it does look nice and very easy to park etc. I also think the aircon clutch might not be engaging. I have to spend some time on some other things so I'll have to come back to it later. At least I have a grocery getter now. Wow you have done a lot of work. I would love to have cruise control! Funny, how it works. I have been putting some time and money into it recently. Recaro drivers seat and had spent a couple of weeks making the back into a comfortable camping car. Then typhoon hits and now lots of stuff to do. You may also want to check the AC fuse - fuses in both boxes (footwell passenger side under the centre access panel + fusebox A near the drivers feet. The salt could have blown a fuse but it may be OK now it's dried. Also those square slow-blow PAL Pacific fuses can furr up, if they are no shiny copper bit to view consider replacing them - jiggle them out with a pair of serrated pliers (or the correct tool but I've not found that!). I have a cruise control thread, the only tricky bit is really connecting up the cable I found, but I have a system that seems to work at least. It's a matter of allowing either cable to pull and settle back without fouling the other. As you are in Japan you could investigate the official Toyota cruise control option, it would be a far easier fit if you remove it from a scrap van that had it fitted. My cruise control keypad is mounted on the dash to the RHS of the steering wheel on a blanking plate. Very interested in your camping conversions: that's the reason I bought a van. And why I modded the swivel 2 seater! I just confirmed the 2nd electric fan is shot. I'll pull it to make sure of the number before ordering it. Where are the drain valves for the cooling system? I also pulled the cover under the drivers seat. I actually did not have time to do anything there. Parking brake: After fussing around I left the assembly intact (inside the car) and took the cable apart at the cable length adjustment location just behind the drivers seat under the car. 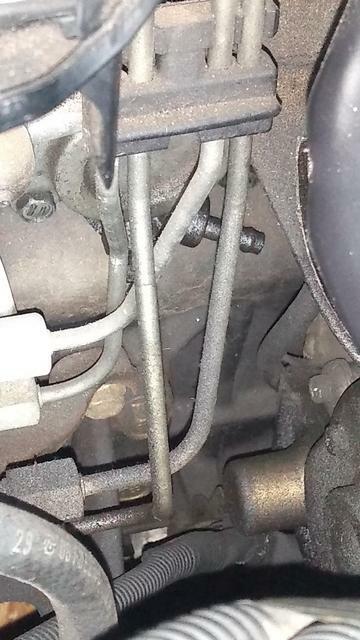 In front of that there is one bolt to remove. Getting it back was an issue until I realized that I could thread the bolt a little bit, and then slip the cable back into position. Do you mean '2nd electric' or '2nd fan (the electric one)' ? I only have one electric cooling fan I've seen - the big horizontal one sitting on top of the A/C and 2nd radiator near the front. When you pull it you may want to see if it's fixable - it may just need plenty of WD40 and easing if it's just stuck. Sorry I haven't got your pics from under the oil filter yet - been busy elsewhere - will get them next time I use it. Good idea about the parking brake, just slipping the cable out. Lots more access with that cover off. Hi, got a picture of one of the nozzles, I guess they had pipes on at one point? Not managed to find the other one yet.